It is the third Friday of Lent tomorrow. Can you believe it is going so fast? Did you give anything up for Lent or promise to start doing something to better yourself? I’m working on being more patient with my children and not talking on my phone while driving. Chicken quesadillas are often a “go to” recipe in my house, especially when we have limited time. 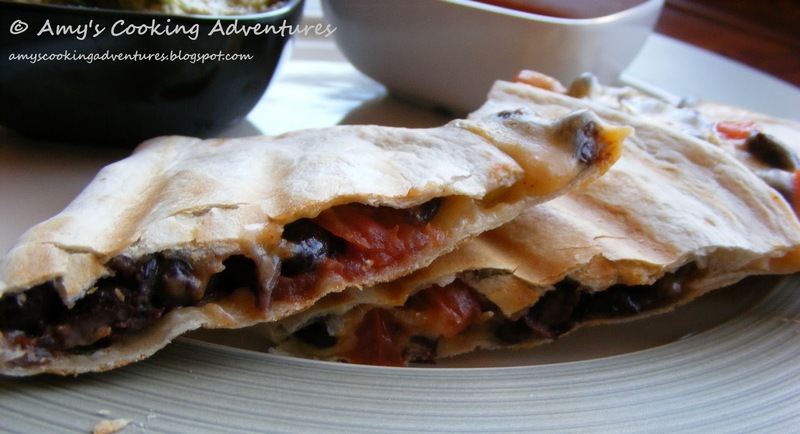 So I thought, why not try a quick and easy meatless quesadilla? The “meat” of this recipe comes in the form of black beans, with a little added spice to make this a little more interesting. I also added just a little bit of tomatoes and onions to fill out the flavor palate. I do not like a lot of tomatoes or onions, so I used them sparingly. If you love them, go ahead and add more! My whole family loves cheese, so I am always very generous with the cheese. My husband and I loved these so much that we are thinking of making it our new “go to” quesadilla recipe. In a bowl, stir together beans, tomatoes, onions, cumin, paprika, and cayenne. Divide filling evenly between the tortillas and top with 1/3 cup of shredded cheese. Fold each tortilla in half and place in a Foreman Grill (or Panini maker), preheated on high. Cook for 4 minutes or until cheese is melty. Serve immediately with guacamole and salsa. Wow these look and sound wonderfully delicious! Yummy! Bookmarking for trial later on! Nice to have found you. These would go down real easy. Very simple to put together. Great go-to recipe. The spices in this really boost the flavor! Looove black beans and love me some quesadillas. These look great. YUM! 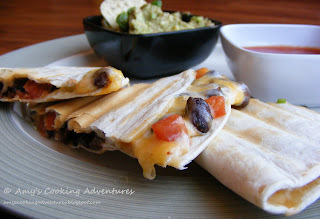 What a great idea for quesadillas - I'm loving this!